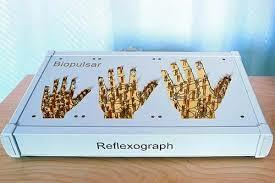 The Biopulsar-Reflexograph® system is a biofeedback tool that gives scientific information and objective interpretations for the full biofield and the body’s electromagnetic field and seven major energy centers. The Biopulsar technology incorporates several proven sciences such as biofeedback, neuroscience, reflexology, kinesiology and body and colour languages to name a few, making it one of the most advanced bioenergetics technology in the world! Accessing the “real-time” energetic information in a few different formats allows the practitioner to instantly analyze the patient on a holistic level–not just physically but mentally, emotionally and spiritually as well. Formats illustrated on screen include organ and glandular graphs, colour organ analysis of the reflex zones, full & half body biofield pictures and chakra analysis.